Do you want to start beekeeping? Depending on the time of year, we can supply 'nucleus' beehives to get you started in beekeeping. We are proud to supply Nucleus Beehives for Langstroth (vertically stacked) beehives and Top Bar (horizontally aligned) beehives. Our 'nucs' are only offered to people in reasonable proximity to Margaret River, WA. We will only sell to those who are registered to keep bees with DAFWA and share our same commitment to being responsible beekeepers. All the information you need to become registered can be found at the DAFWA page for registration-forms-livestock-ownership-western-australia. 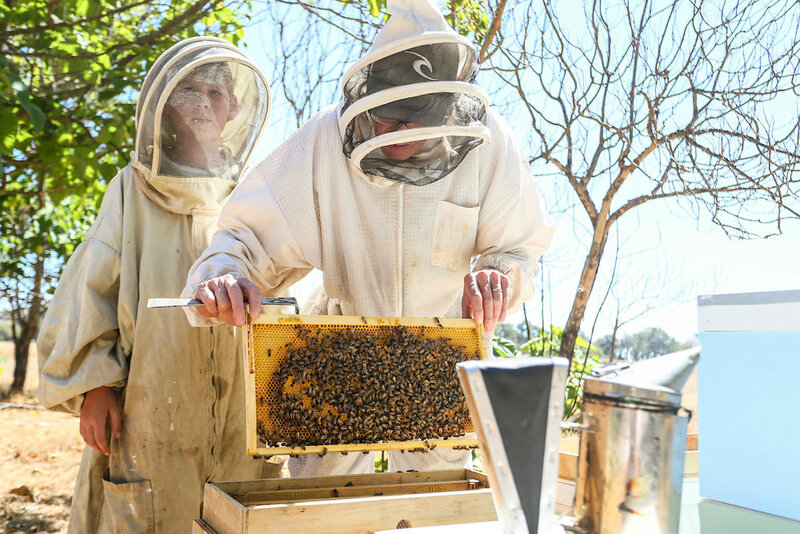 Also, before delving to far, you may want to take a look at the DAFWA page about the suitability of your property for beekeeping. Click this link to view the page. We offer a 'Start-Up Beekeeping Package' which covers the cost, delivery and placement of a nucleus hive on your property plus two return visits. The first return visit will be to check the health of the hive and rehouse the nucleus into its larger hive box. The second will be to check the health of the hive and ideally add the top 'honey super' to the hive. For a Top Bar Nucleus, the visit is to place new bars into the brood area and ensure the comb is building straight. The Start-up Beekeeping Package is a great opportunity to ask questions and build your confidence in and around the hive before going at it solo. Additional visits can be arranged. The Langstroth beehive, patented in October 1852, is the standard beehive used in many parts of the world for beekeeping. The Langstroth hives popularity is owed to the moveable frames to which the bees build their wax. The Flow Hive is a vertically stacked hive which follows the same basic priciples of a standard Langstroth hive. If a natural beekeeping style which is cost effective and relatively ‘light weight’ is what you are looking for, then investigate Top Bar Beekeeping. Rather than vertically stacked boxes, a top bar beehive is horizontally aligned.